Teachers who participate in my workshops often ask very pertinent questions that go right to the heart of formative assessment. I use these questions in a formative manner: to guide my decisions about what to teach and about what material to include in this book. In this chapter, I offer responses to many of those core questions with the hope that in reading them you may find some answers to your own questions about formative assessment. Is Formative Assessment Something New? No and yes. The idea of measuring students' progress in learning in order to determine how and what to teach them has been around at least since the time of Socrates. Today's movement to include formative assessment as a routine part of classroom practice, however, has its roots in work spanning the last 40 years. As noted in Chapter 1, Michael Scriven kicked things off in the late 1960s by coining the term “formative,” and others (Bloom, Hastings, & Madaus, 1971; Crooks, 1988; Sadler, 1989) expanded and refined the idea over the next two decades. However, it wasn't until 1998, when Paul Black and Dylan Wiliam published their seminal article “Inside the Black Box: Raising Standards Through Classroom Assessment,” that the advancement of formative assessment in today's classrooms and schools began to gain momentum. Black and Wiliam's research led them to the conclusion that formative assessment can raise standards and improve learning outcomes. This evidence moved many educational leaders to define and apply formative assessment in classrooms not just in the United States but worldwide. How Does Formative Assessment Differ from Other School Reform Efforts? A teacher once commented that the professional development sessions that kick off every school year always feature the “reform du jour.” Over the years, we all have seen many reforms come and go, but formative assessment differs from most in two important ways. First, it incorporates much of what research has told us about how people learn and about best practices for measuring and improving that learning. Second, formative assessment focuses on the day-to-day interactions between the teacher and the students. Teachers routinely using formative assessment in their classroom practice have insight into what and how well their students are learning and know how to quickly adapt instruction to meet students' needs and further progress toward goals. So formative assessment is different in that it is not a reform but a way to reform and inform education. Formative assessment's focus on informing instruction also means that it can be used in concert with other educational approaches. Whether you are interested in differentiation, constructivism, authentic learning, or standardized testing, formative assessment can help you help your students along the path to mastery. What Makes an Assessment Formative? There are many definitions of formative assessment. Margaret Heritage (2007) describes it as “a systematic process to continuously gather evidence about learning” (p. 140). Carol Boston (2002) explains that it is “the diagnostic use of assessment to provide feedback to teachers and students over the course of instruction” (p. 1). Essentially, formative assessment is a process rather than a product in that it focuses on uncovering what and how well the student understands throughout the course of instruction. What makes any particular assessment formative is not the specific measuring tool employed but how the information gathered from the tool is used. If a teacher uses information from a particular assessment to track learning, give students feedback, and adjust instructional strategies in a way intended to further progress toward learning goals, that teacher is engaging in formative assessment. Formative assessment is also a systematic way for teachers and students to gather evidence of learning, engage students in assessment, and use data to improve teaching and learning. When you use an assessment instrument— a test, a quiz, an essay, or any other kind of classroom activity—analytically and diagnostically to measure the process of learning and then, in turn, to inform yourself or your students of progress and guide further learning, you are engaging in formative assessment. If you were to use the same instrument for the sole purpose of gathering data to report to a district or state or to determine a final grade, you would be engaging in summative assessment. Does Formative Assessment Work in All Content Areas? Yes, formative assessment is effective for any content area. It can be used in language arts, social studies, science, and math, and it is equally effective in health and PE, the arts, and vocational subjects. It also has potential as an interdisciplinary tool. For example, a pre-assessment asking biology students to summarize what they already know about cell structure yields information about vocabulary as well as content knowledge; the teacher can use this insight to inform instruction in both areas. How Can Formative Assessment Support the Curriculum? Curriculum defines the content and sequence of instruction. It identifies the process and products of teaching and learning. Some curricula are broadly designed—think of a scope and sequence or a curriculum map. Other curricula include daily objectives, specific content, learning activities, and assessment strategies. Formative assessment can support all kinds of curricula by providing essential feedback about what students are learning and how well they are learning it. Formative assessment includes strategies that each teacher can employ on a regular basis in the classroom to track learning. Teachers can then change the content and products of instruction to customize learning based on a student's achievement of curricular goals. In this respect, formative assessment guides curriculum through a reflective process focused on student attainment of the goals and standards. How Can Formative Assessment Be Used to Establish Instructional Priorities? Through the consistent use of formative assessment, teachers can quickly gather data to determine whether students are mastering the goals and standards or there are gaps in students' learning. Teachers can then use this information to establish priorities for future lessons. For example, if the majority of your class has mastered a specific standard, you may choose to use instruction time to delve into that standard further or explore an applied aspect of it. If, however, formative assessment data indicate that your students need more instruction or more practice, then you may decide to reteach certain elements or assign more group exercises targeting a particular skill. In this way, formative assessment guides the establishment of priorities for teaching and learning. Although “data-driven instruction” has become a current buzz phrase, it can mean many different things. Some districts are disaggregating the data from standardized tests and using those data to pinpoint students' strengths and weaknesses. Other districts are using this same information to develop “common formative assessments”—assessments given to students in the same grade and taking the same subject—in order to measure subsets of standardized tests. These strategies have a documented purpose but differ from daily formative assessment in that the teacher cannot immediately and routinely use them to determine teaching priorities. How Can Formative Assessment Be Used as a Teaching Strategy? As the saying goes, formative assessment is assessment for learning more than it is assessment of learning. In a formative assessment classroom, teachers still present information through lecture and demonstration and still set tasks; students still complete these tasks and interact with the teacher and with one another. There are a variety of specific strategies associated with formative assessment that are designed to gather data related to student understanding and further instructional objectives. The lexicon in Appendix B describes many of these strategies, and the chapters in Part 2 of this book, covering applications of formative assessment before, during, and after instruction, provide specific examples. The most important idea to keep in mind, however, is that formative assessment as a whole is a planned strategy carried out to improve learning. How Is Formative Assessment Used in Grading? The answer to this question depends on the teacher. There is a brewing controversy about using formative assessment in grading, and it centers on whether or not to grade all students consistently at their level of achievement or to grade their growth toward mastery of standards. If a top student arrives knowing about 90 percent of the content and rises to 100-percent mastery during the course (a net gain of 10 percent), should that student receive a higher grade than a student who came in knowing 50 percent of the content and rose to 75-percent mastery (a net gain of 25 percent)? If the expectation is that all students will master certain standards, then grading at the level of achievement will typically reflect the spread of abilities students bring to the class combined with the additional learning they acquire. If we grade progress toward standards, then a student coming in at 50 percent and rising to 75 percent has learned more than the one going from 90 to 100 percent, and therefore, grades will reflect their growth and final achievement level rather than just their final achievement level. Teachers who believe that grading should reflect growth toward standards include selected formative assessment data in grade determination. They typically do not count every formative activity toward a grade but may factor in data used as benchmarks during instruction. The value placed on formative assessment data will vary among teachers, but generally it is weighted less than summative assessment data. Keep in mind that counting some formative assessment data in grading helps to fairly reflect the learning of those students who have difficulty with more traditional testing formats or experience test anxiety. For the purist who believes that grades should reflect only final summative assessments, the compromise is to report that final grade along with improvement indicators. The bottom line is that everything should be assessed, but not everything needs to be graded, and grades should reflect progress and results. Can Formative Assessment Close Achievement Gaps? Formative assessment definitely helps to close the gap between what students know and what we want them to know. It makes both teachers and students aware of holes in knowledge or understanding, leading teachers to address specific content and provide additional learning strategies to fill in these holes, leading students to set goals and track their progress toward achieving them. In some states and districts, “closing the gap” means teaching specific test content. In others, teaching students how to think and learn across a broad curriculum is thought more effective. Whatever system you may be operating under, formative assessment can help you close achievement gaps. What's the Relationship Between Rubrics and Formative Assessment? Rubrics and formative assessment perform some of the same functions. When used in the formative classroom, rubrics help teachers monitor learning and instruction and also provide meaningful feedback to students. Analytical rubrics include defined criteria that reflect standards, and they have descriptions of varying levels of “quality” performance. When rubrics are given to students prior to an assignment, they help to clarify students' understanding of expectations. Teachers can adapt or adjust a rubric to give more weight to particular criteria in order to differentiate the assignment to meet individual needs. Rubrics support revisions of student work because they make it easy for students and teachers to identify changes that need to be made to meet goals. Teachers find that rubrics make assessment more objective because work is rated only on the given criteria. The development of quality rubrics does take time and thought, but in the long run, they make assessment more consistent and efficient, and the same one can be used for both formative and summative purposes. How Can I Help My Students Understand Formative Assessment? Formative assessment can be a revelation to students who have come to think of themselves as “dumb” or as academic losers, because it gives them a clearer idea of what they need to do to succeed: master this material, acquire this knowledge, or develop these skills. The point of formative assessment is to inform and improve, not to pass judgment. Success breeds success, and motivation grows from it. Use formative assessment from the first day of class, and be sure you scaffold to catch the students who need more support. Research shows that formative assessment is most effective with students at the lower end of the achievement spectrum. This is not to say that these students are less capable; sometimes, they are just disenfranchised and disconnected from traditional school subjects, and the feedback from formative assessment helps to reengage them. The list of things that teachers have to do is a long one, stretching beyond simply teaching, testing, and reporting grades to engaging parents in their child's learning, participating in professional learning communities (PLCs), and responding to psychosocial dilemmas. But I trust that incorporating formative assessment is something that you are going to want to do. Formative assessment is one of the few proven strategies that directly support high-quality instruction and effective assessment. We all want our students to be successful; after all, that is why we become teachers. 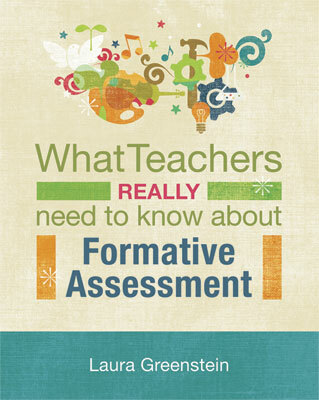 Teachers incorporate formative assessment because it improves teaching and learning. Try it and you'll see. As a starting point for learning more about formative assessment, please consult the References section at the back of the book. Particularly indispensable are the works of Paul Black and Dylan Wiliam (1998), Linda Darling-Hammond (2004), Robert Marzano (2003, 2006), Lori Shepard (2000), Margaret Heritage (2007), W. James Popham (2008), Rick Stiggins (2001, 2002), and Susan Brookhart (1997, 2003). Teachers know that learning gets embedded when it is observed, practiced, discussed, and taught to others. After you have read this book and other source materials, I hope you will reflect on what you have learned. Discuss formative assessment with others. Start a study group or add discussion to PLC time. Attend a workshop or a class. Apply your new knowledge in the classroom.